Giselle Makhan: In love...with my work! Yesterday, I received such a lovely compliment from a young lady I've known for a short while since moving to Cape Town. "You're looking...so happy! Your face is just glowing!" she said. I jokingly responded, "Does it look like I'm in love?!" to which she replied "YES!" I tilted my head and said to her, "I kinda am..."
Of course, she was intrigued! "You ARE?" Truth be told, I am loving what I'm doing! I'm so happy to be back in the classroom teaching after a year off. Of course, teaching children was very rewarding, but teaching adults has completely stolen my heart. I am meeting people from all over the world with such interesting professions and each one pulls at my heartstrings in a way they probably don't even realize. This past Friday was a bit emotional as some students ended their course and they were on their way back to Brazil the following day. Four students in particular - Glauco, Dulciene, Luiz and Fernando - all from Brazil, were part of my Pre-Intermediate class who I just fell in love with. 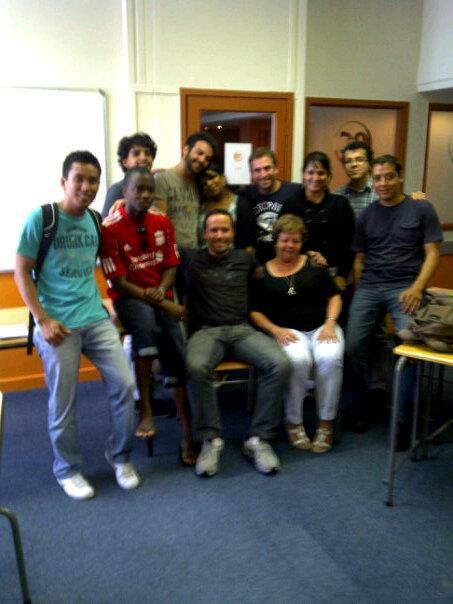 This class was very special, with students from Brazil, Angola, Libya, Turkey and France. We just all got along very well. We laughed a lot and at the same time, while having fun, they were learning just as much. Their spirit and energy were infectious and seeing them everyday for the past 2 weeks brought such joy to me. Waking up at 4am, working non-stop till 5pm, coming home and working more till 11pm was only a pleasure for them. I think I can safely say that I was being driven by passion. My work feels like play! On Friday, my Pre-Int students had to give oral presentations on any given topic. Honestly speaking, I sat there in awe! These students, at Pre-Intermediate level got up in front of the class and spoke with such confidence in a language they are studying. They spoke with such ease and I was so proud of them! I know for sure that I will miss their presence tomorrow (Monday) in class, but by Tuesday I will have a new batch of students and new bonds will be formed yet again. I feel very grateful for our paths to have crossed, and I sincerely wish them all the best for their future endeavors!